Extraordinary levels of programme hours break new record – 50 percent increase on EHF EURO 2008 with 1,700+ hours. Zug, Switzerland / Vienna, Austria, 25 March 2010 – The 2010 television figures for the recent Men’s EHF European Handball Championship (EHF EURO), which took place from 19-31 January in Austria, prove the sustainability of the Infront Sports & Media global media and marketing programme. The 47 matches played in this year’s championship reached a cumulative television audience of over one billion people enjoying an astonishing 1,700 hours of Europe’s best handball action. This magic figure means an increase of 50 percent in the last two years of competition and sets a new record in terms of event coverage on television. Together with the astonishing audience figures from the previous event (1.2 billion in 2008), both broadcasters and viewers have enjoyed an amazing two prong television marketing success story. The results are based on an independent programme analysis, including information provided by broadcast partners worldwide. The report compiled by the German communication research agency Sport+Markt on behalf of Infront - the exclusive commercial partner to the EHF since 1993 - is seen as a conservative estimate for the event's total coverage as some markets were unable to provide audited audience data to meet the full criteria of the study. 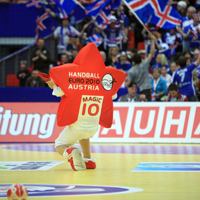 The excellent results are based on the successful global distribution of the media rights for the EHF EURO by Infront and the positive status of the sport of handball on the market.The international sports marketing group based in Switzerland concluded broadcast agreements with 70 territories in Europe, the Middle East, Asia and South America. The event was transmitted by 80 television and radio stations with a total 599 representatives present on-site in Austria, an increase of close to 200 compared to the 2008 event. The 2010 audience figures are the second best in the history of the men’s championships and a close to 300 million viewer increase on the third best result in the history of the event (2006). Audience figures increased considerably in Iceland (+71%), Poland (+66%) and Croatia (+32%). There were also a number of countries that experienced tremendous growth in programme hours - Spain (+73%), France (+57%), Poland (+49%) and Sweden (+40%). The comparative fall in cumulative television audience figures from the previous (1.2 billion) compared to 2010 (1.03 billion) is justified by the performance of a given country’s national team and the comparative population of that country. The overall picture is positive due to the increase in television programming and the sustained levels of audience figures.